I have remember the first time that I ever saw a pomegranate. I was in 2nd grade, and my friend Kim’s mom packed her a pom in her lunch box. I remember being so incredibly jealous of her. Even though she shared her pom arils with me, I wanted to have my own mysterious fruit. Not only was the fruit delicious and sweet, but it was so fun to pull the little seeds out of the skin. I remember dragging my mom to the grocery store and begging her to buy me my own pom. The problem was that I could not remember the name of the fruit. Without dating myself, this was almost 30 years ago, long before pomegranates were mainstream and found in just about every grocery store. Thankfully, we can get poms quite easily these days, but only when in season. When they are gone, they are gone. I was fortunate enough to visit the Pom Wonderful orchards and facility in the San Joaquin Valley in California and came away with a new appreciation for the fruit itself, but also the people that grow it. We stayed at the beautiful and so luxurious Huntley Hotel in Santa Monica, but got to the orchard by way of private plane. While it might seem extravagant to travel by plane, it is just one of the smart solutions that the company employs to make the best product in the most efficient way possible. We took off from Santa Monica and flew to the orchards that are located in between Bakersfield and Fresno. We landed, and drove to see the trees. For miles and miles, all you can see are pomegranate trees, it is truly a sight to see. One of the things that surprised me the most is that each piece of fruit is hand picked. You would think in this day and age, that most everything would be automated, but they really aren’t. Every single piece is picked by hand. We were taken into the orchards by Bernard, who is a ranch manager and he picked a pom off the tree, cut the flesh and passed it around. In my life, I have never seen such a large pomegranate, and the most amazing part? The arils (the technical term for the edible seeds) were cold from the desert night. You know that what you are eating is delicious, when no one is talking. And no one was talking, they were picking the arils out of the skins and listening to Bernard tell us about the harvest. We spent about an hour in the orchard and got back on the plane to head to the Del Ray facility where they sort and package the fruit, and make the Pom Wonderful juice and the bottles they come in. We met with plant manager, Tracy Fornwalt, who was kind enough to give us a tour of the facility and answer all of our many, many, questions about the fruit and how it is processed. The most amazing thing? It is washed, sorted, given a sticker, packed, and shipped. When it comes down to it, it is a very simple process. We saw how the fruit enters the facility and walked with it until it was loaded onto a truck and driven to the consumer. We were also shown how they make the juice and manufacture the bottle. An interesting tidbit – the company’s owner was insistent that juice be bottled in a container that looks like two poms stacked on top of each other with the pom crown on the top. No one was willing to take on this because it was more difficult to create and more expensive. So she did what any go getter would do, she created her own and they are manufactured in the plant as well. The latest product to come from Pom Wonderful is the Pom Pom. Containers of fresh pomegrante arils that are ready to eat. You find them in the produce section and the work has been done for you. There is even an adorable spoon under the lid so you can eat them on the go. We were lucky to have Chef Peter Rukule make us a pomegranate themed lunch that was incredible. Everything we ate was fresh and healthy, and featured the fruit perfectly. My favorite dish served? Korean Barbecue Tacos with Pomegranate Cucumber Kimchee. I need to make these, they were amazing. A few other incredible things we ate: Grilled Fruit Salad with Pomegranate Arils, Turkey Sliders with Pom Relish and Coleslaw, and for dessert POM Semifreddo. Thank you very much to the kind people at POM Wonderful for hosting me on the Harvest Tour and showing me what goes into growing glorious pomegranates. Check back for my next post, where I recreate a meal that we ate during a POM themed dinner at Tavern. In the meantime, here is a recipe that I shared that features POM arils and POM juice. 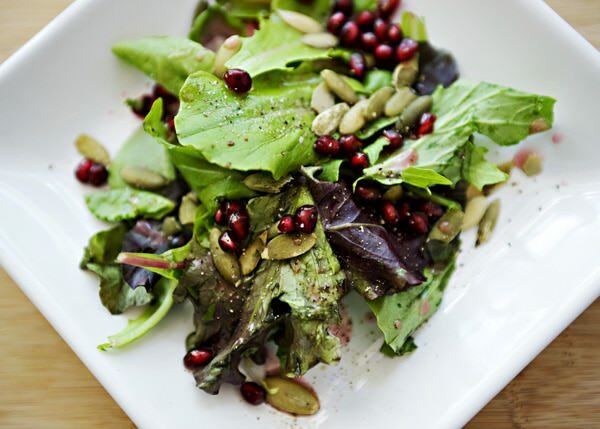 Mixed Greens with Pomegranate Lemon Dressing. One of my favorites! What is your favorite way to eat a pomegranate? I love poms! Their new products look so cute:) However, the poms I find in my store, do not look like the poms in your gorgeous photos;) haha. It doesn’t matter what they look like on the outside, they will be fine when you open it. I had never tried a pomegranate until this past fall, after my 50th birthday! Fifty years with no poms…very sad! I introduced my mother-in-law at Christmas…in her 75th year! Must be something to do with living in Ohio, so far from where they grow. My favorite way to eat them is mixed in with delicious Greek yogurt and a spoonful of blueberry or cherry jam. Yum! PS I so envy your trip. Wow! What? That is sad! It was a great trip. What a trip that must’ve been! Beautiful pictures, and the salad looks wonderful too. It was a great trip. I have a new appreciation and respect for fruit growers. I remember my first (or near) experience with Poms as well. A friend brought one over to our house to share. Being from a small town that only sold waxy red and green apples at the market, it was a mystery fruit. Besides being sweet I remember liking how the fruit colored our hands and clothes. Mom wasn’t happy but I was! These days I add them to everything – salads, oatmeals, meat dishes, and we just enjoy as is. I feel like they add a little something special to each dish!!! They do! Little ruby jewels! I love them sweet and savory too. I live in sunny California and grew up eating poms. Now my girls and I make pomegranate jelly each fall using my husband’s grandma’s pom press. We love poms! Pom jelly? Sign. Me. Up! This winter was the first time I’d ever de-seeded a pomegranate myself…and I’m hooked! It’s always a delight to find them in a salad. Your photos from your trip are beautiful! I love it! I love a POM salad too. So good. And full of antioxidants. Greetings from Victoria BC, Canada. I just finished eating a Pomegranate with my lunch before coming to check out the new website today! Dug throug the leftover peel and found the sticker. Sure enough, POM WONDERFUL !!! Yeah! Love the POM people! What a fabulous post and an awesome trip! I will admit I’m a bit jealous. 🙂 Looks like you had tons of fun and were able to learn a lot. I love poms and can’t wait for the stores here in MI to carry the pom poms. I haven’t been able to find them yet! Looking forward to your post about the recreated dish! I did, it was a great trip! I saw Pom Poms in Wal-Mart recently, they are starting to show up! This is so fascinating! I really detest fruit, but I like fruit juice. I guess it just has to do with texture. But I’ve seen pom wonderful in the store so many times. Every once in a while i think about buying s bottle just to see what it tastes like, but I always forget. Now I’m really going to have to try some. By the way, is the actual fruit edible, or is it just the seeds? Because i think the skin is supposed to be really hard, right? The juice is delicious. It is sweet and tart. My favorite is the one mixed with mango. The seeds are edible, the ski is not. They are crunchy and sort of pop in your mouth. Really good on sweet and savory things. That was absolutely fascinating – somehow I thought Pomegranates came from someplace foreign or tropical – how fun to get to see them actually growing on the tree, right here on US soil – and to tour the processing plant. It sounds like they take a lot of care with their product! Thanks for the info!! T.
Nope! Right here in the USA! They take amazing care of the fruit, such a great trip. Pomegranates are definitely one of the most beautiful fruit! So versatile too and absolutely delicious 🙂 Thanks for the insight into the farming and production!